Human Facets® has a very successful track record working with Global Corporate clients in the United States and internationally. 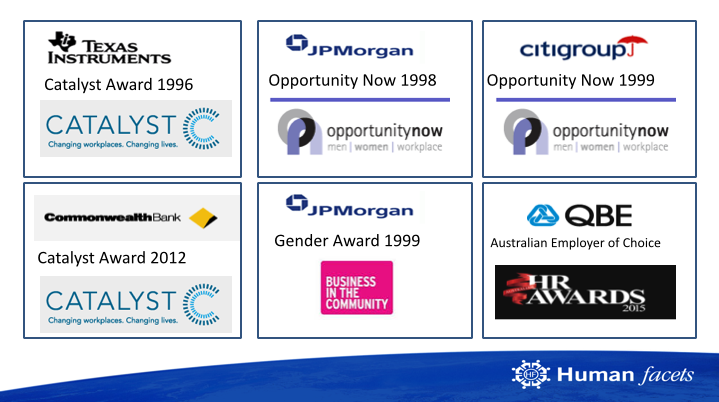 Six of our clients have been recognized by winning high profile Diversity & Inclusion Awards attributing their results in part to using Human Facets® Inclusion and Unconscious Bias programs with their leadership. …Helen, I don’t have words to say how incredibly lucky and fortunate we have all been to have you speak at AIEC. Your talk touched people in so many ways and your words, insights and story-telling was a highlight of our program. I would not exaggerate in saying that it was probably the best opening keynote at AIEC. The feedback has been phenomenal and I have no doubt app and survey feedback will reiterate this. The talk itself was both inspirational and practical, and I truly believe had an impact on how delegates interacted and conversed on topics throughout the rest of the conference and will have an impact beyond the 4 days of the conference. I heard some very positive feedback also about the Q&A session. …Helen Turnbull manages the rare feat of engaging audiences with good humor and energy on the highly serious subject of unconscious bias in the workplace. Her global experience, outstanding results, and great empathy with people at all levels create not merely awareness, but an urgency to improve and progress. Her enthusiasm is infectious and she creates immediate focus, action, and behavior change. …Dr. Turnbull is an excellent facilitator. She demonstrates high levels of engagement with the Unconscious Bias program participants and was the key to the program’s success. Her subject matter knowledge of unconscious bias and diversity gave the program credibility. Dr. Turnbull uses a range of adult learning principles ensuring participants effectively develop the skills to meet the objectives of the program in an interesting and interactive way. She received outstanding feedback from participants. 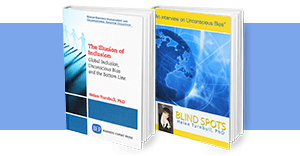 Dr. Turnbull is a global expert in the area of unconscious bias and diversity/inclusion and is a thought leader in this field. She is extremely professional and worked collaboratively with our organization to ensure that the program was successful. She is flexible in adapting to program changes and proactively identified and implemented program improvements during the implementation phase. She operates with high levels of integrity and is friendly and easy to work with. Dr. Turnbull is an engaging and powerful speaker. Her deep knowledge of diversity and inclusion was impressive. I highly recommend Dr. Turnbull. …In my Leadership Role as the Union Chairman, I have the opportunity to be one of the first to attend learning and development sessions/opportunities that will be offered to our membership (at Miller Coors). In the case of the “Building Cultural Sensitivity” work presented by Human Facets® i will admit, I may have been a bit hesitant to engage based on expectations of what benefits could/would be achieved. After attending as a participant, I felt compelled to attend other sessions to hear the dialogue from the various audiences. The attendees in each session were (diverse) cross functional employees with varied tenure, multi level in nature. “Building Cultural Sensitivity” provided a great place for people to share thoughts and experiences in a unique way and with people that they might not have ever had the opportunity to do so with. It truly was about awareness and sharing in a very non-threatening way that seemed to allow for greater openness and hopefully understanding. By the final few sessions I observed there were more and more Thank you’s to each other for the sharing. Ultimately, how it evolved and ended up was more than expected. THANKS to Human Facets® for the experience. …Helen was a known expert in the field of diversity and organisational development in the US, but it is to her great credit that she managed to translate and sell the concepts to a wholly sceptical and initially unreceptive multi-national audience in the London office. The Leading Diversity 1-day training programme that she delivered over a two year period to in excess of 1500 officers and staff of the bank was the most ambitious and successful training intervention ever introduced in Europe. Helen’s skills as a facilitator are second to none. She is intuitive, fluid, articulate and natural, spotting and heading off potential “hot spots” and providing an environment where people feel safe to express their views and know they will be heard. Her antenna are always up, yet she appears at complete ease with her audience and never radiates anything but calm and control. But Helen has much more to offer than just stand up training and facilitation. Her OD skills are fabulous and her holistic approach to culture change is practical and realistic yet inspirational. Whatever she does, she takes people with her and makes the journey seem immensely worthwhile. …Dr. Helen Turnbull has an intuitive talent for working with groups, large or small. At Texas Instruments she has consulted on Diversity initiatives, teaming and empowerment initiatives and strategic change efforts. In each case she brought the same exceptional skill and talent to all of these diverse projects. Her ability to customize the design and to think on her feet ensure that Helen sets an exemplary example of consulting at its best. …Dr. Helen Turnbull recently was voted one of two faculty members within our university community of over 26,000 students as the professor students would most like to hear speak about where she finds meaning and purpose in life in the NSU Last Lecture Series. Dr. Turnbull is clearly knowledgeable, organized and engaging. Her presentation provided opportunities for all learning styles to connect and combined important lessons, illuminating her depth of experience in a very down-to-earth, conversational style that captured the audience’s attention. Afterwards, students and staff stayed in the lecture hall waiting to ask questions in an attempt to glean additional insights from her. After the presentation, many asked if it was possible to get a copy of her speech or Powerpoint presentation. One student remarked that there was so much good information, he couldn’t capture it in one sitting. Explore our customized Diversity and Global Inclusion Solutions or contact us directly at (954) 370-6343.